Tips for spending a day on the island of Santorini for cruisers and other visitors short on time. One example of the stunning architecture of Santorini. For such a small island, there is a lot to see and do on Santorini, the stunningly gorgeous Greek isle that is such a wondrous place it’s rumored in legend to be the lost city of Atlantis. Here is how to best spend one day in Santorini to experience as much of the island as possible. Most people arrive to Santorini via water and that should be the start of your experience in Santorini. 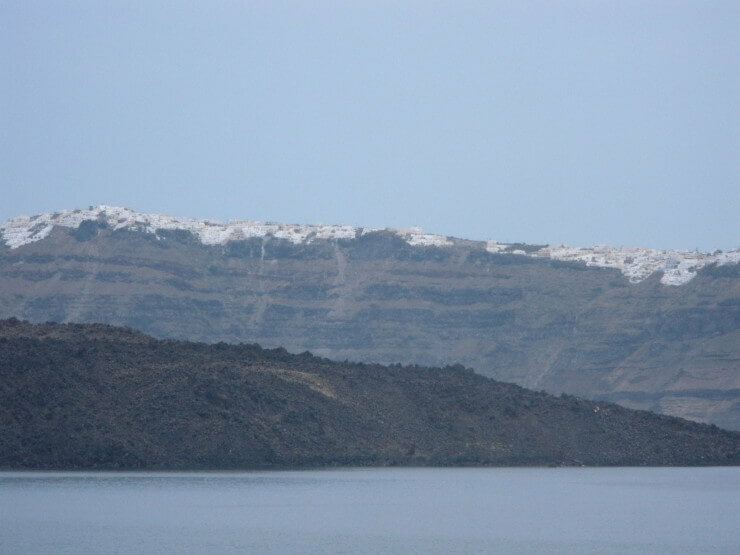 Get outside and to the edge of the boat once Santorini comes into view and stay there for the entire ride in as you’ll most likely be sailing between the caldera and volcano, offering incredible views of both. The now mostly submerged volcano erupted thousands of years ago and the eruption was so powerful it resulted in most of the island falling into the ocean and producing the caldera, on which many of Santorini’s most picturesque towns perch. Fira is the main town in Santorini and will probably be the first you hit during your one day in Santorini. Fira lacks a lot of the charm the other towns and villages of Santorini have and is a bit of a tourist trap so plan on getting out of there quickly. Here are the main sites to see once you leave Fira: The Red Beach, one of the black beaches, Oia, and the sunset. Read on to find out what to do at each one. 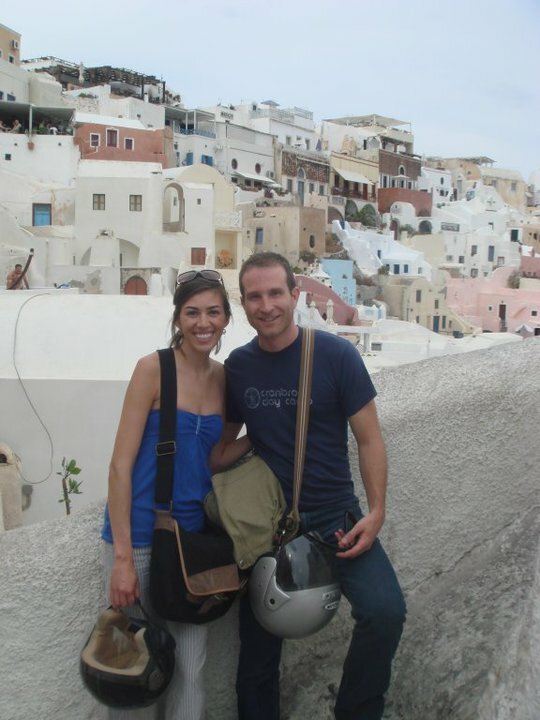 Get my free Santorini Transportation Cheat Sheet sent to you now by entering your email below. This helpful 2-page document tells you the best ways to get to and around Santorini. Success! 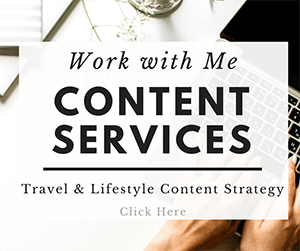 BUT there's ONE MORE QUICK STEP to get your Santorini Transportation Cheat Sheet -- Check your email and confirm your subscription (if you don't see the email, check your junk folder) and then you'll get an email with a link to the document. You'll also be subscribed to One Day in a City's newsletter which has helpful travel tips, news, and giveaways, but you can unsubscribe at any time you'd like. I look forward to having you part of the One Day in a City community! While you may not have time to lie on the beach if you only have one day in Santorini, you should still visit them because the beaches there are pretty remarkable due to the volcanic ash. The Red Beach is my favorite. After a climb over some rocks (note it is a bit of a hike to get there from the town of Akrotiri so may not be ideal for some people) you descend upon a narrow piece of beach with red pebbles and a red and black rock backdrop cradling a little alcove of turquoise water. It’s a stunning sight. 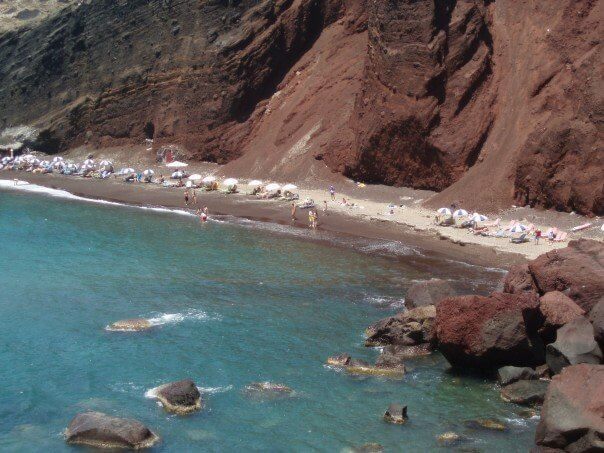 Santorini has a few black beaches – called so due the volcanic ash permeating the sand and giving it a black tint. Perissa Beach is easily accessible and a good choice if you want to visit one of the black beaches. Keep in mind the black sand means walking on it is extra hot so be careful stepping on it without shoes. If you’re hungry after your beach jaunt try one of the restaurants in the area and enjoy the beach view while you eat. Don’t dawdle too much at lunch as you’ll probably want a few hours to spend in Oia once you’re there. Oia is a tiny town, but it lures you into its charm and makes it hard to want to leave. Swimsuit for those beautiful beaches. These ones are good for warm weather, but sturdy (necessary for cliffside trails!). You also may want to throw some water shoes into your daypack since the black beaches get hot to walk on. During the drive up to Oia, you can pass some of the vineyards and wineries. If wine tasting is your thing, stop for a tasting, otherwise, keep going so you’ll have more time at the other sites. 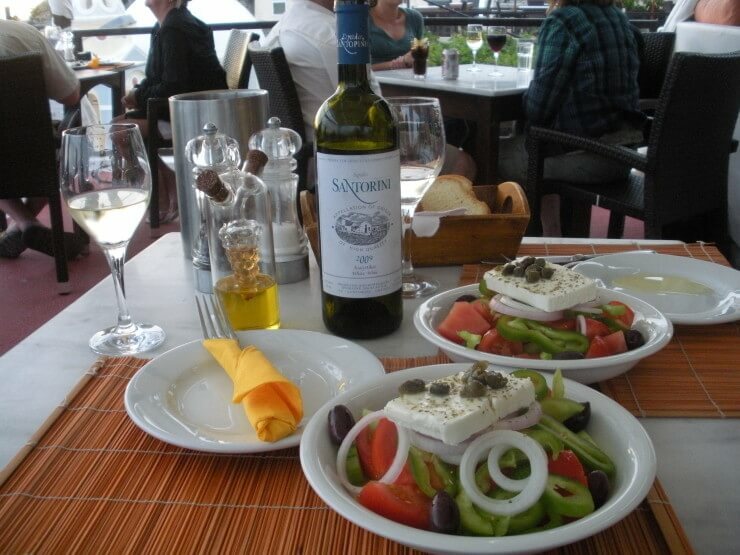 Many restaurants also serve wine produced in Santorini so you can try the local wine with lunch or dinner to help save on time. Oia is built into the side of the cliff with some definite gravity defying buildings hugging the edge of the caldera. The precarious looking nature of the architecture results in some jaw-dropping views. Walk around the many paths winding through Oia and enjoy the views of the volcano, ocean, white-washed buildings, and blue domed churches. And keep an eye out for donkeys running through – or leaving behind some surprises on the ground! Oia is my favorite place in Santorini and it’s hard not to fall in love forever with the island while wandering around it. Watching the sunset from Oia is ideal. However, for some people who have ferries or cruise ships to catch shortly after it sets, getting back from Oia in time isn’t your best bet and can be risky if you have to rely on public transportation due to needing to find a taxi or take a bus if your scooter or car has already needed to be returned. 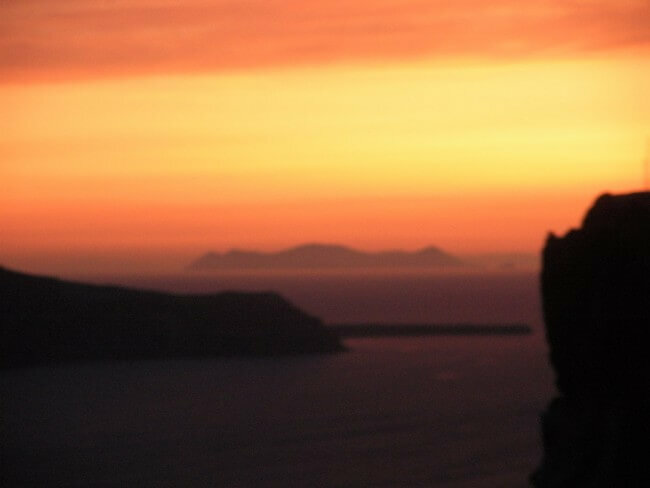 In that case, head to the north part of Fira and eat at one of the several restaurants situated along the caldera there that are perfect for dinner while you watch the sunset. Make a reservation or get there early in order to get a prime sunset viewing table. Had an excellent dinner and view at Zafora restaurant. The above sightseeing is if you have a completely full day in Santorini. If you’re really short on time in Santorini, I recommend just visiting Oia – it is quintessential Santorini and what most people have in mind when they dream of Santorini. If you need somewhere to lie your head while in Santorini, I have two options. The first is in Oia, because I love it there. The second is in Fira, and is a good option if you need somewhere to sleep before catching a ferry off the island the following day. Oia Hotel Option: Aris Caves Hotel, which puts you up front and center to all of Oia’s charm, including an incredible view of the sea and volcano, and luxurious cave rooms dug into the side of the caldera. Click here to see pictures and prices for Aris Cave Hotel. Fira Hotel Option: Dream Island Hotel makes it convenient to get to and from the harbor by arranging transportation for you and giving you a place to stow your bag if the ferry leaves later in the day. It also has well-appointed rooms and sea views. Click here to see pictures and prices for Dream Island Hotel. 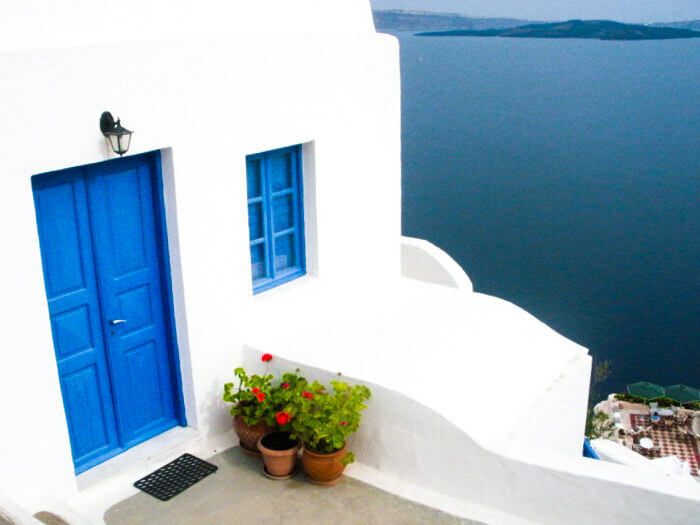 You can also search for other Santorini hotels using Booking.com and choose the one with your favorite view. There are some pretty amazing ones! 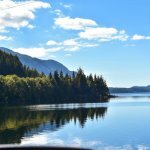 Booking.com is my favorite accommodation reservation site for Europe since it is easy to use, includes the lowest prices, and has free cancellation for most hotels. Found these Santorini tips helpful? Pin for later! This article was originally published on January 26, 2011; updated on October 9, 2015. We plan to visit Athens in four days in mid April and would love to visit Santoroni. Since we don’t have much time, we are thinking to fly to Santorini in the morning and come back to Athens in the evening or late night. We wonder one day in Santoroni should be enough or it’s better to stay at least one night. I would definitely recommend staying a night, particularly if leaving the same day would mean having to leave before sunset. My family with total 4 people would stay in Santorini for 3 nights in coming June. What would you recommend for us to do in Santorini for these4 days? 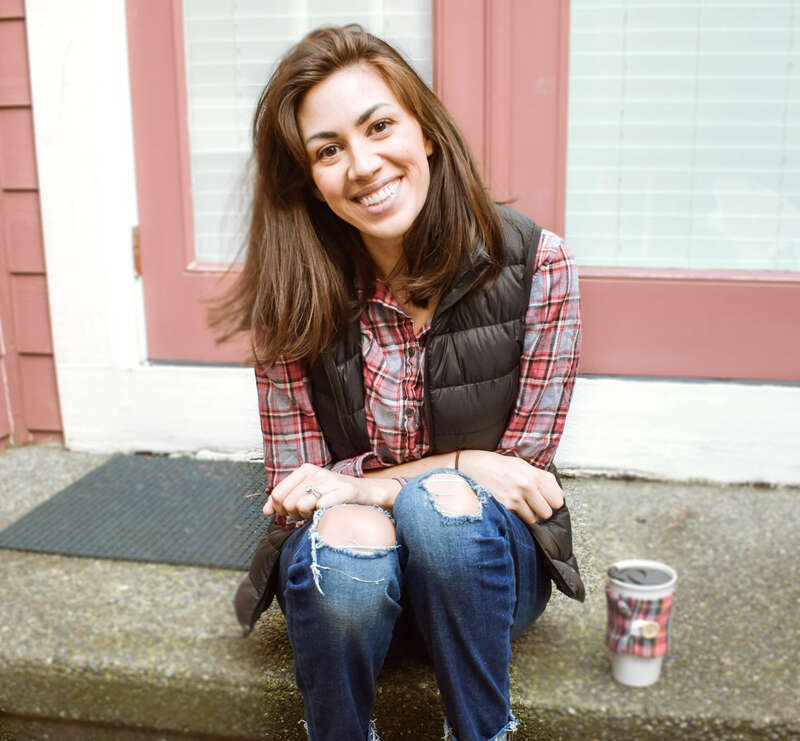 Hi Gina, your blogs are divine!! I am visiting Santorini in the first week of June for 2 days and would be staying in the Fira town. We wont hiring a car or a scooter as we haven’t got international drivers license. What is the next best option to see the island? Hi Pia, we didn’t need an International Driver’s License to rent a 4-wheeler and that was very easy to use to get around the island. I wrote more about that here: https://www.onedayinacity.com/scooters-4-wheelers-and-santorini/ Have fun in Santorini! Hi! I chanced upon your blog as I was researching about a trip to Greece in late September. Hi Vivian, it’s definitely possible if you fly instead of taking a ferry. 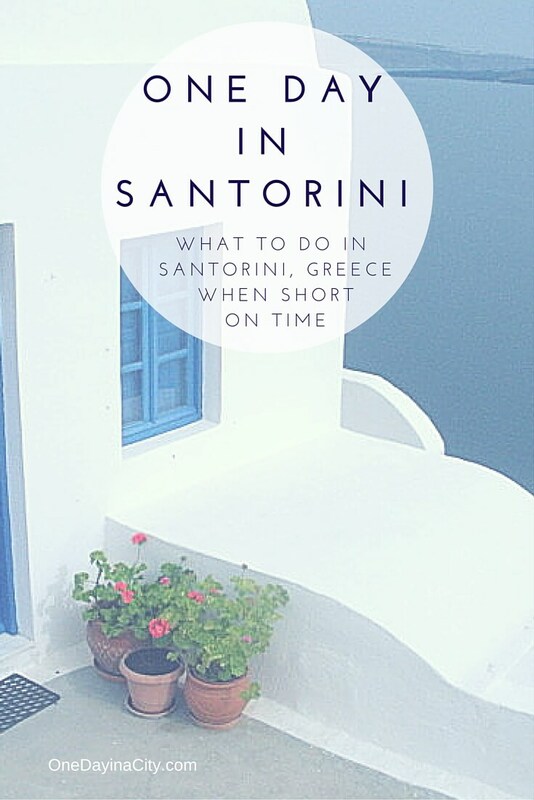 I love Santorini so I would of course recommend staying the night so you have more time 🙂 but if that’s not possible, I would try to find the earliest flight / latest flight as possible to and from Santorini from Athens. Then take a cab from the airport as opposed to public transportation so you can quickly start your day in Santorini. Hope that helps! Hi, Thank you for all your post. We will be visiting Santorini in Cruise on September 2015. The cruise docks at 7:00 am and departs at 5:00 pm. Not sure on which port. But, what is your recommendation on how to tour Santorini in 10 hours? Hi Vicki, you’ll still be able to enjoy it, though it will likely be blocked a bit more by the caldera. Enjoy your trip! Oceania is a great cruise line. We visit Santorini as part of our cruise in September and it is also our 25th wedding anniversary.!! What would you recommend so we get the most from our day but to also mean it is relaxing and memorable! I fancy somewhere nice for lunch and not fussed about the beach. I would definitely rent your own transportation for the day. You’ll be able to see more of the island. If your cruise leaves late enough, make dinner reservations in Fira at a restaurant on the caldera and request a table that is on the edge for the best view of the sunset. (Or Oia, preferably, but most cruise lines don’t leave late enough to give you time to get back to your ship from Oia after the sun sets.) Hope you enjoy your cruise! Thanks for nice tips Gina. Hi, we are booked for the Celebrity Cruise in october and the ship will leave Santorini at 9pm. I’m traveling with friends i a big group. We arrive at 2pm. Do you think it’s best to do the tour on our own or best to book it with the cruise ship. Your blog is great. I chanced on it while doing research for our up coming trip. Thanks so much, Mia! My second time in Santorini was on a Celebrity cruise. You’re going to have a great time. As for doing it on your own or booking a tour, it kind of depends on what you want to see. If you want to visit the historic sites or some of the wineries, a tour might be best since then you’ll also have a guide. If you just want to explore the beaches or streets of Oia, I’d recommend renting a car or some 4-wheelers and doing it on your own. Also, one thing to note if doing it on your own is that you’re going to get off the ship later. I think Celebrity still tenders while in port in Santorini which means you’ll have to get a ticket for a time to take a small boat to shore. Those with shore excursions through Celebrity get priority to leave first. For tickets, make sure you get to the counter onboard the second they start releasing them so you can get one of the first slots to leave the ship after the excursion passengers get off. Thanks for the blog. We have booked Royal Princess cruise and it will be reaching at Santorini at 7 am and leave at 10 pm. Could you please advise if we can cover the island in a day if we hire a 4 wheeler? How much extra time is consumed in picking and dropping of the vehicle and how much they cost to hire for a day? Is it a better option than taking a guided tour offered by Royal Princess? Thanks! We have booked royal princess cruise and it will be reaching santorini at 7 am and leaving at 10 pm could you please advise if we can cover the island in a day if we hire a 4 wheeler? How much extra time is consumed in picking and dropping off the vehicle and how much do they cost to hire for the day. Is it better to do this than take a guided tour offered by Royal princess. What is another alternative to the 4 wheeler, Oia is something I do not want to miss. Hi Carol, it’s pretty easy to take a 4 wheeler to Oia. It didn’t take longer than 15 minutes to pick up and less than that to drop off. Make sure you find out when they close and give yourself plenty of time to get back to your ship (that is a big benefit of doing a shore excursion on Santorini through the cruise line as they’ll make sure you’re back to the ship on time. Normally not a problem though if you don’t rush yourself at the end.) You can see the whole island in a day, but it won’t include much time for stopping. If Oia is really important to you, focus on that and maybe skip the beaches on the south end of the island. Also, I’m not completely sure of the shore excursion options on Royal Princess, but I’m guessing you’ll have more time to explore Oia if you go there on your own than via a guided tour. Make sure you check how much time you’re given there. It’s definitely a town that’s lovely to meander around at your leisure — and a great place to grab a bite to eat. Glad you found the blog helpful, Jacqueline! Enjoy your trip! This an excellent review on the best places to stay in Santorini and our preferred village is Imerovigli and Oia. I must say your blog is excellent and also have great pictures! I have learned some new things from you and it will be on my to-do list when I plan my visit to Greece. 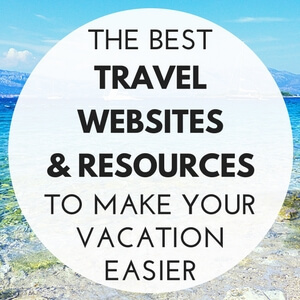 What a great guide for travelers. All about this island is just amazing! Thanks for sharing. Wow! Thank you so much for posting this! It is helping me tremendously. We will be cruising around July 4th this year and get in at 1pm and leave at 10pm. Do you have a suggestion on when we need to start heading back to the ship? I know the cable car usually has a long time. When should we make dinner reservations for? Very helpful blog. I will be visiting Santorini on royal Caribbean cruise with my 78 year old father. The ship arrives at 2pm and leaves at 10 pm. 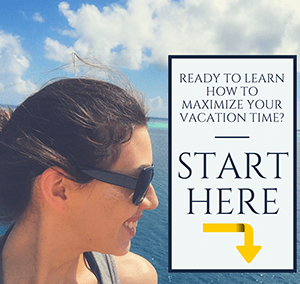 What do you recommend regarding shore excursion? Double check sunset time for when you’re there, but I would think your ship doesn’t leave until after the sun sets and will give you time to get back. I’d recommend an island tour shore excursion in the afternoon that is 3-4 hours and then to have dinner reservations somewhere in Fira along the caldera to watch the sunset. Oia is best for the sunset, but you’ll want to make sure you can get back to the ship in time if you watch it there. My cruise will dock at Piraeus at 7am and will leave the port at 5pm. What would be the best means of transport to Santorini given that 10hrs ? Hi Joo, I don’t recommend going to Santorini while in port in Piraeus. You’ll lose too much time in transport to make it worth it. Instead, I recommend exploring Athens while there.